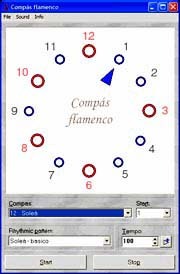 Compás flamenco is a flamenco-metronome for a personal computer (Windows 2000 und Windows XP). 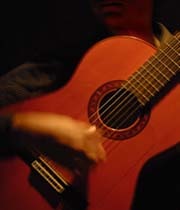 Compás flamenco supports all flamenco-rhythms and also conventional rhythms with 4 or 3 beats. 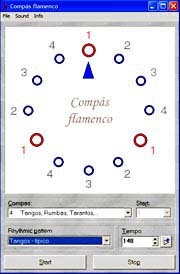 For each Rhythm several rhythmical patterns are provided, ranging from a very basic rhythmical pattern to more complex patterns which are typical for the respective flamenco sytle (Palo). 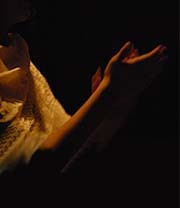 These include typical hand-clapping patterns or patterns used by the Cajón. The strong beats of the rhythms are also visually and acustically (deactivation possible) emphasized. 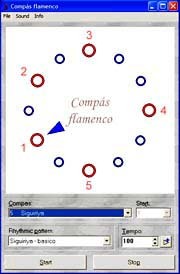 The counting pattern is displayed for each flamenco style. For some styles different counting patterns may used. For these styles the user may select the couting pattern he feels more comfortable with. For example, for Siguiriyas either a Rhythm with 12 beats is commonly applied or a counting scheme from 1 to 5. Similarly, for Bulería either a rhythm with 12 beats or a rhythm with 6 beats is commonly used. 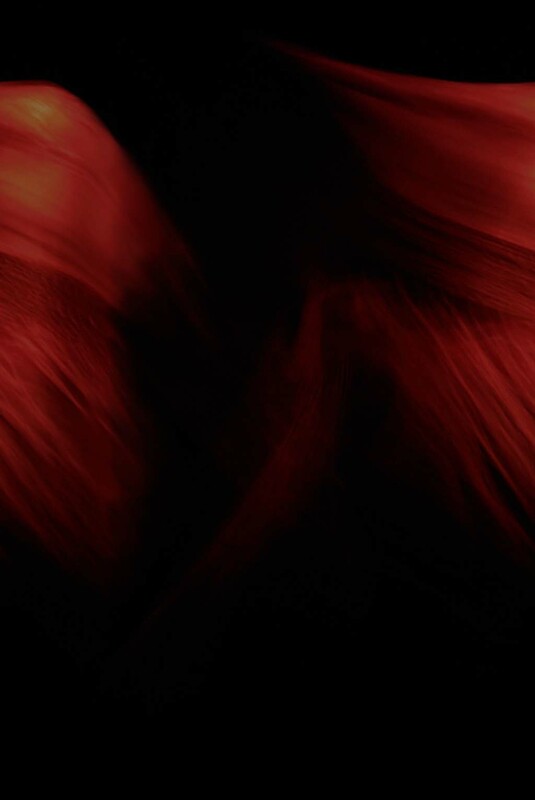 (for further information see the section about flamenco rhythms). The tempo of the metronome may range between 20 and 300 beats per minute. Additionally, the tempo can set to automatic acceleration for practicing purposes. Interested to try Compás flamenco now? Then click "Buy it!" to see the current price list or to purchase the program.